For the longest time, the ability to just talk to a machine was a pipedream, the stuff of sci-fi. No longer. Over the years, our interaction with machines has evolved — from command line prompts to mouse-based, graphical UIs to touch-screen interfaces. And while tech keeps improving, it still requires us to adapt to new forms of communication. Enter voice marketing. We can trace efforts to build voice technology back to 1960 with IBM’s Shoebox, the first attempt at voice recognition. But it is only in the past decade, thanks to the advances in Artificial Intelligence (AI) and Natural Language Processing (NLP), that conversational interfaces have become within reach of the general population. We’ve seen an explosion in AI-powered voice assistants and chatbots — from smartphones to smart speakers — that now let us converse with our computers, phones, and devices. 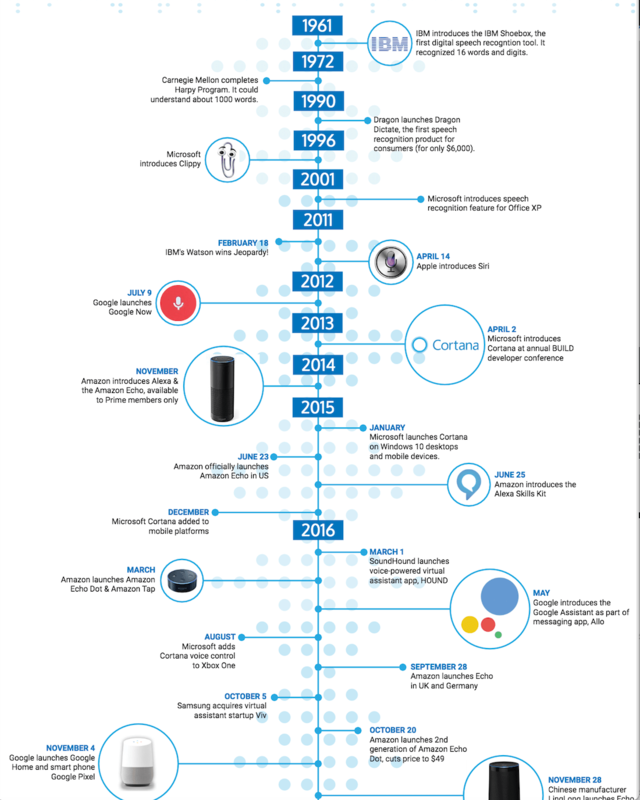 Voice was first introduced to mass market through Apple’s Siri, followed by Google Now. Since then, voice usage on mobile has exploded. Siri and Google Now lead the pack when it comes to voice assistants on smartphones; Amazon’s Echo and Google Home are the leaders in the smart speaker category. Voice has crept into people’s lives and integrated into their daily routine. So, when and how are people using voice? While the trend started with voice assistants on smartphones, the trigger that turns voice into a product phenomenon could be smart speakers. With Amazon’s Echo leading the way, sales of smart speakers have risen exponentially in the past few years. The evidence is around us. Nearly 19 million US households now use smart speakers, a 50 percent increase from December 2017 to February 2018. At the same time, the number of Alexa skills has seen a 3x increase year-over-year, indicating exploding interest in the developer community to engage users through Alexa devices. At home, with smart speakers generally situated in living rooms or bedrooms, it’s no surprise they’re being used to handle daily household tasks and activities like listening to music, checking forecasts, hearing the news, etc. Interestingly, research shows that smart speaker users of voice assistants are more engaged than mobile phone users. Smart speakers are changing user behavior, conditioning us to use voice for more activities and making it more normal. This could in turn boost usage of voice on smartphones and other devices as customers grow accustomed to using voice interfaces for daily tasks. It is quite clear that voice interfaces are here to stay. Next, we need to understand the implications of this new phenomenon. In his 2016 Google I/O keynote, Sundar Pichai, Google’s CEO, announced that 20 percent of all mobile searches on Android are voice queries. According to Location World, more than 40 percent of adults used voice-based search on a daily basis in 2016. And predictions by ComScore estimate that more than 50 percent of searches will be voice-based by 2020. Why this sudden jump in adoption? 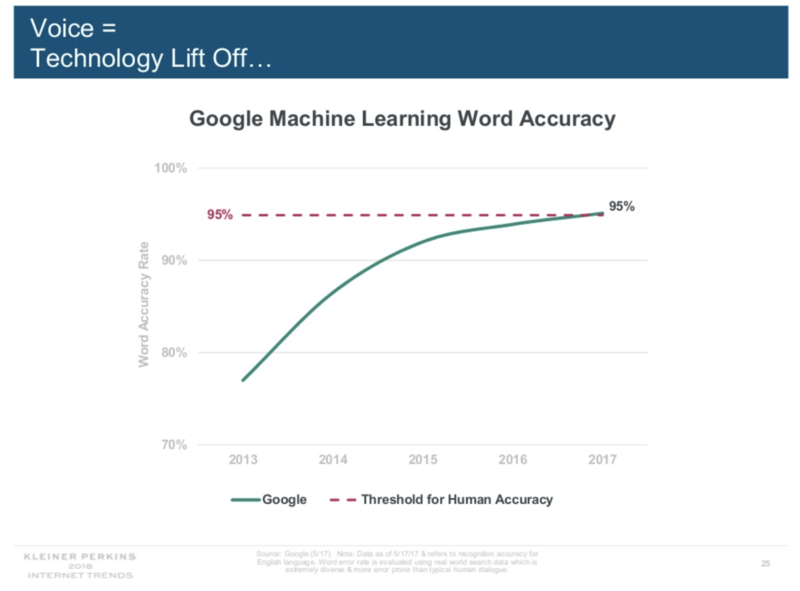 Increasingly sophisticated technology has made voice search less error-prone and able to decipher more complexity in queries, making voice more efficient and valuable to users. So what are the implications of this impending revolution? Traditional search has conditioned us to be minimalistic in using search terms. But as voice assistants become capable of handling increasingly complex queries, our queries and interactions with the assistants will become longer and more conversational. This can provide more context about user intent, which, in turn, can help marketers better assess where the user is along their customer journey. As voice assistants become more integrated into our daily lives, they are going to become an increasingly important channel through which we discover information, make purchases, and interact with websites. The nature of voice search results means there will be intense pressure to capture the top spot in voice search engine results. 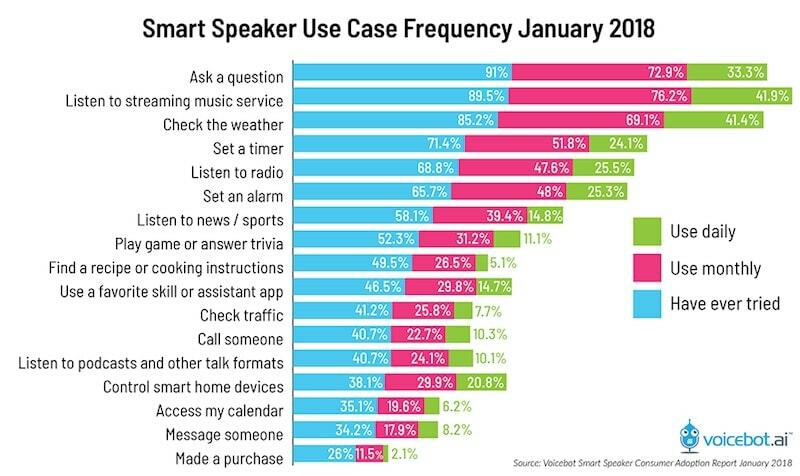 If customers use smart speakers to save time, they will be more likely to go with the choice presented by their smart speaker, rather than ask for more options. This will have a long-term effect on consumer behavior as shoppers shift their allegiance from brands to their voice assistant platforms. All this brings us to a larger and more consequential long-term implication of voice assistants: The consumer belief in their voice assistants as a trusted source of truth. As voice platforms become the default interfaces for home systems, appliances, and the internet, consumer trust in them to deliver the best possible choice will keep growing, possibly displacing brand loyalty. That’s why brands need to start thinking about their voice strategy now. As the use of voice assistants becomes more prevalent, marketers need to assess their strategy to ensure they are ready to adapt to the changing needs and behaviors of consumers. First, voice search queries are more specific (and local) than your regular search, so your website content should be updated accordingly. Second, when considering your strategy for voice interfaces, less is always more. Voice-based engagement should be as non-intrusive as possible — it’s easy to turn off customers with messages that scream advertising. Your voice engagement’s primary focus should be to engage and provide value to the user. Take a look at brands like Moet Hennessy, Tide, and Patron. They have all built Alexa skills so they can engage their users even as they educate or inform them. Brands can create loyal customers — focusing on content — without having to overtly market to them. Patron’s “Ask Patron” skill on Alexa enables users to ask for cocktail recommendations, recipes, and tips. This is part of Patron’s effort to create a more meaningful and direct relationship with their users by creating experiences across their user journey. Since Patron added its Ask Patron skill on Alexa, it has accumulated 36,000 users of the skill, the majority of whom are repeat customers indicating high engagement. That’s voice marketing engagement worth shouting from the rooftops. You don’t have to build a voice marketing strategy from scratch. The lessons used for mobile apps can be applied to voice as well. Marketers ought to use the additional nuance and context provided by these conversational interfaces to ensure a more personalized and one-to-one engagement strategy with their users. As voice interfaces look to fundamentally transform how we interact with our personal technologies, marketers need to understand this disruptive force to ensure they brands can maintain and grow their relationships with their customers. Leanplum is a mobile engagement platform that helps forward-looking brands like Grab, Tinder, and Tesco meet the real-time needs of their customers. Schedule your personalized demo here.